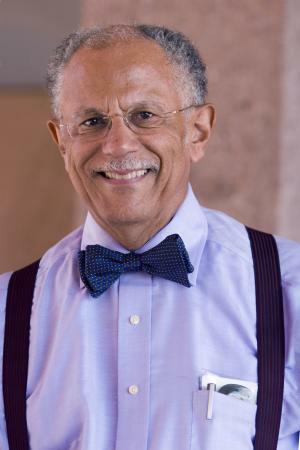 The White House announced today that climate scientist Warren Washington of the National Center for Atmospheric Research (NCAR) has been selected as one of the this year's ten recipients of the National Medal of Science, one of the "the highest honors bestowed by the United States government on scientists, engineers, and inventors." Washington is an internationally recognized expert on atmospheric science and climate research and a pioneer in using computer models, which employ fundamental laws of physics to predict future states of the atmosphere, to study Earth’s climate. He has served as a science advisor to former presidents Carter, Reagan, George H. W. Bush, Clinton, and George W. Bush, published almost 200 papers in professional journals, and garnered dozens of national and international awards. He also served on the National Science Board for 12 years and was its chair for 2002 to 2006. Washington became one of the first developers of groundbreaking atmospheric computer models in collaboration with his colleague, Akira Kasahara, when he came to NCAR in the early 1960s. With support from NSF and the Department of Energy, Washington subsequently worked to incorporate the oceans and sea ice into climate models. Such models were used extensively in the 2007 assessment by the Intergovernmental Panel on Climate Change, for which Washington and a number of scientists at NCAR and around the world shared the 2007 Nobel Peace Prize. Washington was born and grew up in Portland, Oregon. He became interested in science in grade school, going on to earn a bachelor’s degree in physics and master’s degree in meteorology from Oregon State University, and then a doctorate in meteorology from Pennsylvania State University. In 1963, he joined NCAR as a research scientist. As was true for the United States in September 2010, temperatures were also well above average globally. The preliminary analysis posted today by NOAA's National Climatic Data Center shows that September temperatures were "tied with 1998 as the eighth warmest on record." The combined land and ocean average temperature was 0.50°C (0.90°F) above the 20th century average of 15.0°C (59.0°F). 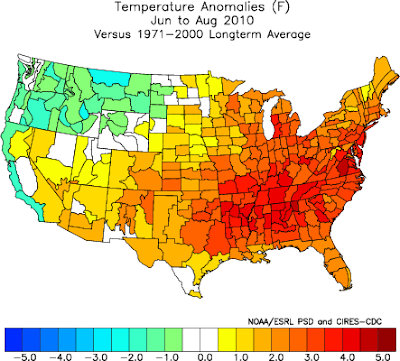 September temperatures have now been above the climatological average for over 30 consecutive years. For the year to date, the global land and ocean temperature departure of 0.65°C (1.17°F) is tied with 1998 as the warmest on record. Much warmer than average temperatures dominated many land areas in September. Notable exceptions were western Canada, central Europe, western Siberia, and western Australia, which were cooler than average. Most of the Atlantic, Indian, and western Pacific oceans were above average, but the Equatorial and eastern Pacific were below average, reflecting a developing moderate La Niña condition. According to the NOAA Climate Prediction Center, "La Niña is expected to last at least into the Northern Hemisphere spring 2011." Wilmington records extend back to 1871, Richmond and Norfolk to 1871. Nationwide, an impressive 194 new high temperature records were set on October 11 and 81 more on October 12. The number of low temperature records were 1 each on those 2 days, giving a ratio of 137.5:1 for heat records vs. cold records. For the month of October so far, the totals are 970 heat records and 242 cold records, a ratio of 4:1. Temperatures well up into the 80s set or tied records in the Mid Atlantic and Southeast on October 11. The high temperature today of 86° at Washington Dulles smashed the old record for the date by 8°. The previous record, which had been originally set in 1980 and matched in 1995 and 2001, was vulnerable, since it was only 1° above the lowest maximum temperature record for October. The 82° at Wallops Island VA broke the old record of 81° in 1990. The high of 88° at Washington National was a little short of reaching the record of 90°. Norfolk VA also saw a near-miss with a high of 87°, just 1° below the record. Chattanooga records date back to 1879, Atlanta to 1878, Columbia to 1887, Augusta to 1873.